LyntonWeb kicked off the project by working closely with TMS to determine the content needs for its users. Once essential content was established, we guided TMS towards a navigation structure and templates that would help accomplish its goals on the HubSpot platform. One of the main goals was to clearly delineate the company’s offerings, which include seven distinct products. Each product is now showcased in two main areas. A custom dropdown menu features the lineup of products prominently on the homepage. Additional goals included updating the color palette and overall look and feel of the site. Brighter, inviting colors were introduced to the mix, along with a streamlined, modern design that reflected the company’s advanced product offerings. One more aim was to increase opportunities for inbound marketing, which was accomplished through various offers. 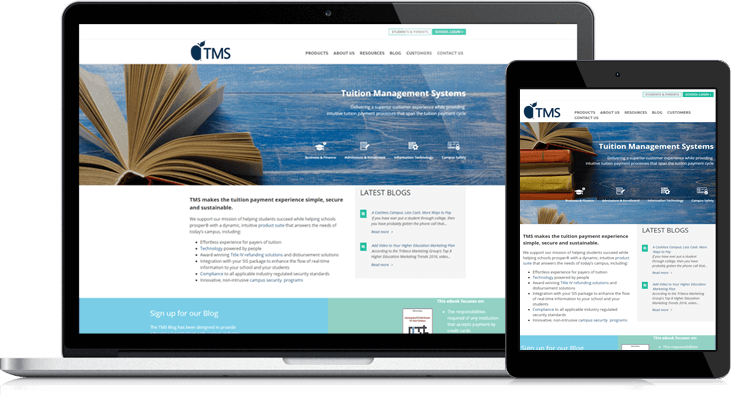 TMS plans to continue to offer e-books, webinars, demos and blog posts as part of its marketing efforts to generate interest in its products through its redesigned site.